THX certified in wall speaker featuring KEF's 'sit anywhere' Uni-Q driver array for a great sound no matter where you sit in the room. The KEF Ci4100QL-THX is a THX certified in wall speaker and features KEF's sophisticated 'sit anywhere' uni-q driver array which positions the tweeter in the acoustic centre of the bass/midrange cone. By doing this, the tweeter and woofer can act as a single point source to broadly and evenly distribute the sound throughout the room. with the discreet Ultra Thin Bezel (UTB) that offers the slimmest possible visible rim around the speaker, the Ci Q Series range gives you the ultimate freedom to position the speakers to your preference. 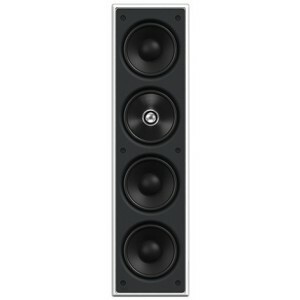 The grilles on the KEF Ci4100QL are retained by a powerful magnetic circuit for installation in seconds. Powder-coated grilles, moisture-resistant fixings and other special materials, the KEF Ci Series speakers can withstand humid and salt spray conditions such as bathrooms, near pools, beside the ocean or on a yacht.